1. Are traditional industrial-grade power supplies suited for LED applications? The majority of general purpose power supplies provide constant voltage output, while LEDs prefer to operate with constant current drivers. The exception is for some LED blocks or lamps, which require constant voltage either 12 or 24VDC. Most industrial power supplies are designed to operate up to 40°C ambient temperature without power derating, while LED drivers are frequently required to operate up to 55°C ambient without derating for many indoor and outdoor applications. The majority of industrial power supplies do not have waterproof and lightning protection features which are required for most outdoor LED lamps. 2. Which are the most common configurations for connecting multiple LEDs? Most LED lighting applications utilize large numbers of high-brightness LEDs. LEDs can be connected in several different configurations. The most common configuration is connecting LEDs in series. 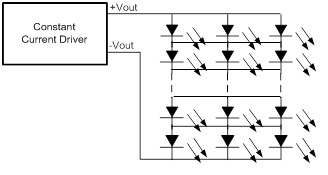 With this configuration a single constant current driver illuminates the entire string of LEDs. If any LED fails open all LEDs in that string will stop operating, while the other strings will continue operating. If any LED fails short, that string will carry higher current that the other strings increasing the stress levels of the remaining LEDs. A matrix configuration is similar to a parallel configuration but extra connections are used to help minimize the effects of individual LED failures. Multiple LEDs are connected in parallel and then stacked is series. The total voltage and current would remain unchanged from the parallel configuration. If any LED fails short would cause the row of LED to stop operating while the remaining LEDs would be unaffected. Current sharing is a directly related to the matching of the LEDs. 3. What are the advantages to using high efficiency LED drivers? The main reason for converting from conventional lighting to solid state (LED) lighting is the higher efficiency associated with LEDs. Higher efficiency directly translates to energy savings. Today there are many initiatives aggressively driving reductions in energy consumption and related costs. It is logical to used LED drivers with high efficiency. A driver with 90% efficiency driving an LED with a MTBF of 40000 hours, will save over 500 Kilowatt hours of power consumption during the LEDs lifetime, compared to a driver with only 80% efficiency. The higher efficiency driver will generate much less unwanted heat, extending its MTBF. A driver with 90% efficiency will generate less than half the heat of a driver with 80% efficiency. The lower efficiency increases component temperatures decreasing their expected lifetimes. For example, electrolytic capacitors lifetimes will decrease by 50% for every 10ºC increase in temperature. Higher efficiency drivers will have 3 to 4 times longer expected lifetimes with higher reliability. 4. What are the advantages to using long-life LED drivers? How are they different? The main advantages to using LED lighting solutions are higher efficiency and lower maintenance costs. LEDs have longer lifetime expectancy than other lighting solutions giving them a distinct advantage with respect to lower maintenance costs. However, if in a LED lighting system the drivers’ MTBF doesn’t equal that of he LED the maintenance cost becomes comparable to that of a conventional light solution negating the justification for the conversion. The expected lifetime of an LED driver is determined by the number of components and the expected lifetime of each component. 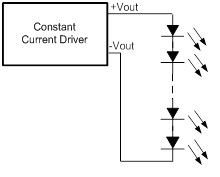 The components that mostly influence the lifetime of the driver are the electrolytic capacitors. Only long-life high quality electrolytic capacitors should be used. The lifetime of an electrolytic capacitor decreases by half with every 10ºC increase in temperature. When designing a LED driver it is important to design in efficiency to reduce the dissipated heat, as well as thermal convection to minimize the component heating. 5. What is Power Factor (PF) and Power Factor Correction (PFC) and how are they relevant to specifying LED drivers? Power Factor is a unitless ratio of real power to apparent power in an AC powered system. PF is expressed as a number between 0 and 1. A PF of 1 is the ideal case. Real power is the actual power used by the driver. The apparent power is the power delivered to the driver from AC source. As the apparent power is the product of the load current and load voltage and because the voltage and current may be out of phase, this product may be significantly greater than the real power. Meaning more power is delivered to the driver than is used by the driver. Power Factor Correction (PFC) refers to a method that increases (corrects) the PF to a number as close to 1 as possible. Currently there are many certification standards that require PFC in LED drivers. A driver with a low PF will draw more power from a utility that a driver with a high PF. This higher input power results in higher utility costs for the same output power. Power Factor Correction is a very important feature of any AC/DC LED driver system. 6. What are the advantages of using LED drivers with potting? Is potting necessary? There are two advantages to potting. The first is it provides ingress protection (IP) from dust and water. Potting protects the internal components from coming in contact with water under many conditions, which is critical in outdoor lighting applications. The second advantage is that potting has better thermal conductivity than air, and as such potting helps conduct heat from internal components to the surface of the driver case. The thermal conduction helps to significantly reduce the thermal stress on the components by as much as 40ºC, increasing the components lifetime and the lifetime and reliability of the driver. 7. How are waterproof levels specified for LED drivers? The water protection level is known as “Ingress Protection” abbreviated as IP. The IP rating specifies the level of immunity to dust or solid material, and water (liquids) penetration of the driver case. The IP rating typically has two numbers. The first number indicates the protection from dust or solid material ranging fro 0 to 6. The second number indicates the protection level from liquid penetration ranging from 0 to 8. The conditions for water protection the numbers represent as given below.